Invisalign is a new dental procedure that involves the application of invisible aligners as a trendy and effective alternative to traditional metal braces. Our cosmetic dentistry specialists recommend Invisalign for those who qualify, promising impressive results and the freedom for the patient to be able to put in and remove the invisible trays as they please. While Invisalign is a highly advantageous procedure that more and more patients across the nation are investing in, there can be some drawbacks to the product as well. 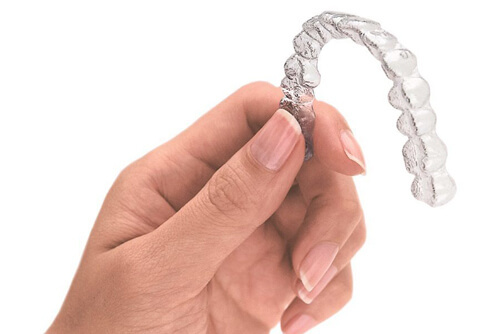 Our Corpus Christi dentists have designed a list of the pros and cons of Invisalign that can help you decide if this is the right product for you. Invisible trays. You can slip them on your teeth, and they are almost undetectable to people around you. They aren’t unattractive and unwieldy like metal braces are. Removable parts. Invisalign is not a permanent fixture like metal braces are. They can be removed and cleaned while you brush and floss your teeth, and then put back in at a later time. Oral hygiene can improve. Many patients report that Invisalign has encouraged them to eat less, which improves the health of their teeth. They also brush and floss more, which encourages a bright and white smile. Requires discipline. Those who don’t follow the instructions or keep the trays in for long enough may not see the desired results. New aligner is needed every two weeks. While you will still see the orthodontist less frequently than you would with traditional metal braces, it is still required that you visit the dentist and purchase new trays every two weeks or so. A slight lisp. Those who just start Invisalign may experience a lisp in their speech patterns. The lisp is only temporary, however. Despite the drawbacks of Invisalign, there are plenty of advantages that keep patients coming back for more. While this alternative to braces may not be for everyone, it offers a way to improve cosmetic look and offer more freedom to the patient. Consult Us for Invisalign Today! If you’re interested in pursuing Invisalign to solve your cosmetic dentistry needs, visit us at Boss Dental Care in Corpus Christi for a consultation. Our cosmetic dentistry specialists can give you the best advice when considering the pros and cons of Invisalign. Feel free to give us a call at 361-245-5400 or visit our contact page to contact us and to see a full range of services.